Have you entered the Giftcard Giveaway yet? Do that now, then come back! The giveaway is now closed. So, my blog advisers (aka, my sisters) suggested that I needed a "real" tutorial to help round out my post line-up. The unanimous vote was for a pennant banner, which I'll be honest: I kind of thought it was no-tutorial necessary. But they disagree. So here it is-a ridiculously easy DIY! Unless you want wide, fat triangles, you need to start out with a rectangular piece of material. I was using craft foam from the Dollar Tree that came in pre-cut sheets of 4x6 size. Basically, you can cut a regular piece of scrapbook paper in half, that will give you 6x12 sheets, or you can cut them any other size you desire. If you use 6x12 you will end up with long, narrow triangles (which is kind of fun), and the closer your dimensions get the more "even" your triangles will be. I have found 4x6 to be a nice size. Start by measuring to the center of the bottom of your triangle, on the "short" side of your rectangle. You want to mark your halfway point with a dot. I measured to 2 inches and marked that. Then, using your ruler, place it touching the corner of your sheet on the diagonal, with the bottom crossing your center point and draw a line. I am pretty sure I learned this in geometry- I don't remember, I try to block those things out! Do the same thing on the other side. Ta-da! You have officially drawn a triangle! Yay for math! I wanted some of my pieces to be embellished with washi tape, so I went ahead and laid a stripe across the top, *before* cutting out the triangle, so it would be even with the sides. You should be able to cut out several triangles at once. Don't do what I did and lay your tape on the traced side, flip it over and put it on the back, so you won't see the pencil lines. I had to move mine. Keep cutting until you have the desired number of triangles. You can do the math-each triangle is 4 inches at the top, and divide it into the number of feet you want. Or you can throw some ribbon up to measure that way. Or you can just wing it. I'll let you guess my preferred method! I recommend laying your triangles out the way you want to glue them down-especially if you are spelling out words. This helps to eliminate gluing errors! The easiest way to attach them to the ribbon that I have found is to run a line of glue across the *very* top of your triangle (especially if your ribbon is thin, like mine), and then flip them over and stick them to the ribbon. You can leave spaces in between, I chose not to this time, I placed them right next to each other. 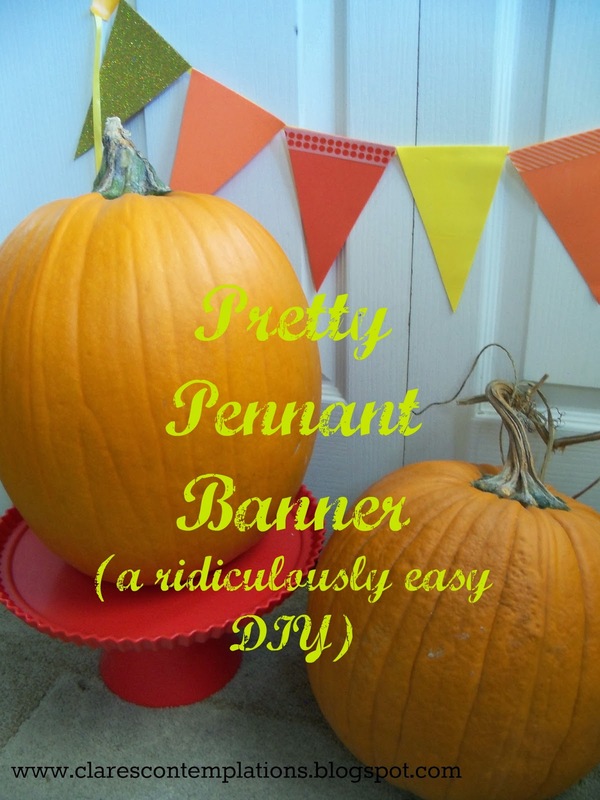 And in just a few minutes, you will have a charming pennant banner, suitable for all types of events, or just decorating your house! I was delighted to find I had fall colored foam on hand, it looks so festive with my pumpkins. Knowing how to make these is like knowing how to bake a chocolate cake-its a party classic that will always serve you well! This is Day 22 of "31 Days of Perfect Party Planning". See the rest of the series here.